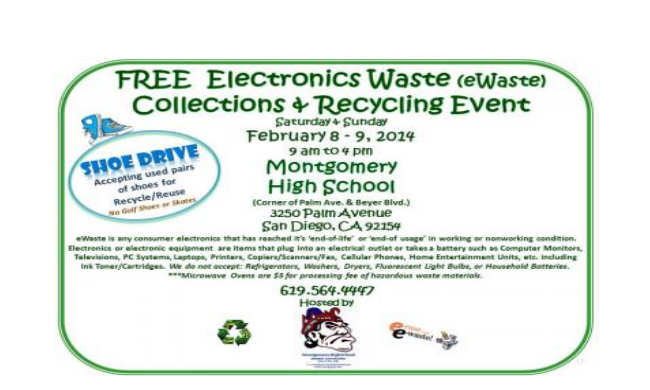 On Saturday and Sunday, February 8 - 9, the Montgomery High School Alumni Association is holding an E-Waste AND Shoe Recycling Event at Montgomery High School – Parking Lot, 3250 Palm Avenue, San Diego (Corner of Palm Avenue and Beyer Blvd.) We are inviting residents and businesses to donate their unwanted electronics and old but usable pairs of shoes at this FREE Community Recycling Event. This is a great opportunity to dispose of any unwanted electronics and shoes while benefiting the Montgomery High School Alumni Association. Thank You for Supporting Responsible Recycling!